West Ham United manager Sam Allardyce fears his side could be on the receiving end of a Manchester United backlash at Old Trafford on Saturday. United have won just one of the first five Premier League games - against QPR - under Louis van Gaal and lost 5-3 at Leicester City in their last outing. 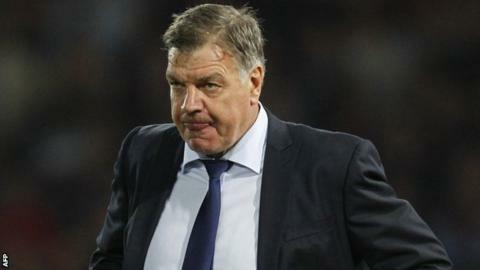 "They will be pretty down about that performance," said Allardyce. "But they'll be really fired up to make sure that they try and perform like they did against QPR and beat us." West Ham start the weekend eighth in the table following a 3-1 home victory against Liverpool on 20 September. But the Hammers have not beaten United in the last 11 attempts in the league. Last season West Ham went down 3-1 at Old Trafford before losing 2-0 at home, with Wayne Rooney scoring both goals, the first a brilliant lob from just inside the Hammers' half. Allardyce knows the likes of Rooney, Radamel Falcao and Angel Di Maria will be desperate to atone last weekend's defeat when United lost after squandering a 3-1 lead to newly-promoted Leicester. Asked if it was a good time to face Van Gaal's side, the Hammers boss added: "No. I'm thinking a backlash. "They will be hurting and they know the only way they can put that right is to get out on to the field and punish us for it. "We will have to be careful about that. "A draw would be great for me, anything more than a draw would be outstanding as far as I'm concerned. "My players have got to look forward to a tough game at Old Trafford now and test their skills and test their ability at a stadium that can obviously be daunting for some players."